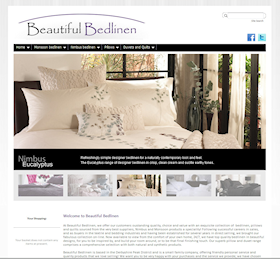 BeautifulBedlinen.co.uk provides a powerful new sales outlet for an existing small business venture supplying high quality brand-name bed linen and accessories. The move into e-commerce is designed to boost sales, opening up a market not previously tapped with the company’s existing direct sales techniques. The new logo and website layout were designed by WyeTec, and used to template and brand WyeTec’s proprietary shopping cart technology – providing the shop owners with a comprehensive and cost-effective on-line shop. The new logo and design work has been propagated through to the company’s business stationery to provide a coherent brand message on all correspondence. BeautifulBedlinen.co.uk uses WyeTec’s proprietary e-commerce system to offer a range of high quality bed linen for sale on-line. The use of high quality professional photography adds an overall feel of quality and luxury to the site. WyeTec’s e-commerce system places control of stock items and website content in the hands of the shop owners who, with minimal guidance from WyeTec, have populated the shop with products. 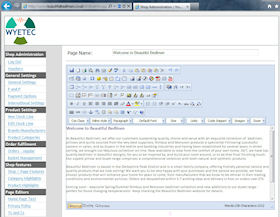 As well as standard product details, shopping cart facilities and order management tools, the WyeTec e-commerce system incorporates various features to aid with search engine rankings, such as URL aliasing – which gives a "friendly" web address to each product, and Google XML site-map generation tool. As well as stock management and order fulfilment, the e-commerce system’s administration functions include a mini CMS – allowing HTML content to be authored and published by the shop’s owners. With the site launched, the hard work of promoting the site both on and off the Internet begins in order to ensure that it generates sales. And as our shopping cart technology continues to evolve and develop, new features are being added to the shop to enhance the visitor experience, improve sales conversion rates, and up-sell.